The 2018 Ford Escape is better than ever. Now with more advanced technology such as hands free lift gate and voice activates SYNC technology the 2018 Ford Escape is more advanced than ever before. Not only that but the 2018 Ford Escape now offers more safety features and Eco boost technology. 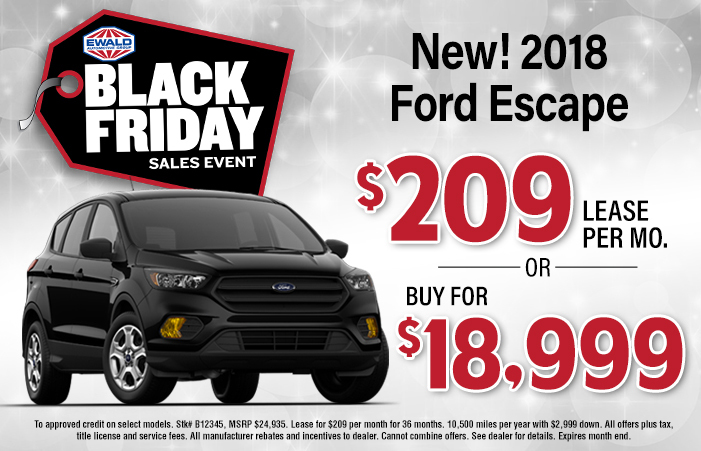 You will not want to miss out on this fantastic new 2018 Ford Escape. Looking for a crossover that will make all of your daily driving needs a breeze? Then you need to come to your local Ford dealer in Cudahy, WI and see the all-new Ford Escape for lease. Now with more advanced technology such as hands, free liftgate and voice activate SYNC technology the 2018 Ford Escape is more advanced than ever before. Not only that but the 2018 Ford Escape now offers more safety features and Ecoboost Engine technology. With Ecoboost technology, the Ford Escape gets excellent fuel economy. This Ford SUV for lease is sure to turn heads no matter where you go with an all-new body style. The Ford Escape for lease is ready for whatever your life throws at it here in Cudahy, WI. The Ford Escape has taken a note from hatchbacks with a more sloped roofline and flat tailgate.With a taller roofline, you will stand out from the crowd no matter where you are. Front and rear LED lights are wrapped in chrome to perfectly light up the iconic Ford Emblem. The Ford Escape for lease also features 17-inch alloy wheels that wrap the Ford Escape up into a well thought out and designed vehicle. The exterior of this Ford SUV is not the only thing to go through a redesign the interior of the Ford Escape also comes with eye-catching and impressive features that you will not want to miss. A Leather/Metal-Look Gear Shift Knob and Leatherette Door Trim Insert give the interior of this SUV for lease the ideal look and feel of a high-end vehicle without the price tag of one. Everything about the Ford Escape was created with the driver in mind, from the soft touch features to the slightly angled touchscreen. This Ford Escape for lease also comes with heated leather seats that are power adjustable. Make your drivers seat your favorite place to be with 4-way power adjusters and lower lumbar support. Never be frustrated again when someone else drives your Ford with memory seating. With the push of a button your seat, steering wheel and mirrors are all back to where you like them. This SUV also comes with a heated leather steering wheel with steering wheel controls. Keep the peace when it comes to the temperature of this Ford for lease with multi-zone climate controls. Now you and your passenger can be at the ideal temperature no matter how hot or cold that may be. When you are looking for an SUV for lease that is going to make heads turn as you drive through the streets of Cudahy, WI and comes with every technology feature you can think of you need to go and see the Ford Escape for lease in Cudahy, WI. Access all of your favorite music, and more from the easy to use touchscreen command center and even pick a playlist or song with the voice command system. With Adaptive cruise controls, all you need to do is set a speed and set a distance and let your vehicle do the rest. The Escape can sense when traffic is slowing down and will follow to keep the distance and will speed back up as traffic does. The Ford Escape for lease also comes with state-of-the-art safety features that are sure to give you peace of mind as you drive through the streets of Cudahy, WI. With blind spot monitoring your SUV will alert you to when someone is in your blind spot when you go to change lanes. Lane-keeping assist will send you visual and audio signals when you have drifted too far into another lane. Forward collision alert sends you visual and audio signals when it foresees a possible crash and will even pre-charge the brakes for accelerated stopping time. Come to your local Ford dealership and see for yourself just how impressive this new Ford SUV for lease is here in Cudahy, WI. When you are ready to drive off your next SUV come to Ewald’s Venus Ford and see one of the many new and used cars for sale in Cudahy, Wisconsin. That includes the all-new Ford Escape for sale here in Cudahy, WI. This Ford Escape for lease is ready to take on all of your driving needs and will do it with style. If Ford lease deals are not what you are looking for, come and see one of the many other Ford SUVs for sale like the Ford Edge for sale in Cudahy, WI. Come to Ewald’s Venus, and see for yourself just how impressive this Ford SUV for lease is here in Cudahy, Wisconsin.